For band, chorus, and orchestra students in schools around Florida, All-State is the Super Bowl of music performances. In January, the Florida Music Educators' Association (FMEA) will host a Professional Development Conference at the Tampa Convention Center which will showcase some of the greatest musicians in the state. According to the FMEA website, the annual event is one of the largest music education professional development events in the United States. Attendees include secondary music directors, elementary music teachers, music supervisors, college music teachers, school administrators, and nearly 3,000 students performing in the All-State ensembles. In an honor considered as prestigious in the K-12 music universe as Super Bowl MVP is in the world of sports, six extraordinarily talented Space Coast Jr./Sr. High School students were selected to participate in All-State. Brianna Bradley, an 8th grader, had mixed feelings about learning she had been selected for All-State's Middle School Mix Choir. "I was really happy but I was also upset because one of my good friends didn't make it," she said. "I wanted to be able to go through this experience with her." Despite the disappointment, Brianna is looking forward to her first trip to All-State. "The best part is it lets everyone know that I work hard to get to where I am. I want to work hard so I can be the best singer I can be." Ciera Paul, a 12th grader, made the All-State Women's Choir. "I consider myself pretty manly when it comes to how I sing," she said with a smile. The heightened quality of musical talent is compelling to Ciera. "All-State is a great experience because you're around people with the same passion as you have and with people who have worked as hard as you have to get to where you are. You know everyone is going to be trying their best." Much as she loves it, heading to All-State isn't just about the music. "I'm looking forward to the gourmet lollipops sold in the convention center," Ciera joked. "There's blueberry cheesecake and Caribbean dream. I bought 75 of them last year." Sara Flanigan, an 11th grader, also made the All-State Women's Choir. "It's not often you get an opportunity like this," she said. "All-State is a giant learning experience. I'm looking forward to the actual performance itself. Getting on stage, performing, and having that sense of achievement and knowing all of that hard work has paid off. The audience will love it." Norman McCorvey, a 12th grader, will be attending All-State for the 5th time. He will be participating in the Reading Choir. "It requires participants to read music spontaneously," he said. "After we finish one piece, we get another one. On the stage, we have to be able to look at the music for the first time and just start singing." Norman credits Space Coast's Choral Director and Junior Orchestra Director, Mr. Michell Avey, with helping him and other students maximize their potential as musicians. "Mr. Avey is tough on his students in the sense that he wants them to reach their potential," said Norman. "He gives students a lot of feedback and really wants them to excel." "Mr. Avey has been really helpful," said Sara. "He points out the areas you did well and also helps pinpoint what you need to improve to get better." "They've worked extremely hard," said Mr. Avey. "I'm proud of all of them. They'll be in an environment where every single person is passionate about music. It's just a caliber of musicianship that you only experience a few times in your life." The skills students learn at All-State will also open up leadership opportunities. "It's a great way for students to learn new techniques from the directors they're working with," said Mr. Avey. "They are the ambassadors for our program and will be taking back these strategies to use them as leaders in the classroom to further our program." Adelle Paltin, a 9th grader who has played the violin for four and a half years, is going to All-State for the first time. "I am super excited," she said. "I'm excited about playing harder music, seeing more and more challenging pieces, and getting to play with people who are a much higher level than I am so I know what to strive for in the future." It has not been missed on Adelle just how much support she has received from several key teachers. Ms. Christina Cuny is Space Coast's Band Director. "Ms. Cuny is very supportive," said Adelle. "She wants you to achieve big goals like making All-State." Mrs. Linda Waid also works closely with developing the skills of orchestra students. "Mrs. Waid helps me prepare the music and gives me constructive criticism to help me get better," said Adelle. Working with a local music instructor, Mr. Casey Moorman, has also benefited Adelle's growth as a violinist. "Taking private lessons with Mr. Moorman has been one of the best decisions I've ever made," said Adelle. "He helps me try things that I've never done before. He prepares me with better music and more skills. He encourages me to audition more to get my name out there so people know what I'm capable of doing." Adelle isn't the only student who has a tremendous amount of respect for Mr. Moorman. "Mr. Moorman is a very kind man," said Norman. "He is amazing. He is one the best violinists I know." Paul Rigolini, a 12th grader, made All-State High School Band. He plans to attend college and pursue a career in music education. "I've always loved music," he said. "I'm excited about All-State." Ms. Cuny is proud of what her students have accomplished. "Both Adelle and Paul have worked very hard to be chosen to represent Space Coast in the Honor Groups," she said. "It's a great privilege and I know they will represent us well." A harmonic truth: Space Coast's MVPs of music will be ready for super All-Star performances. 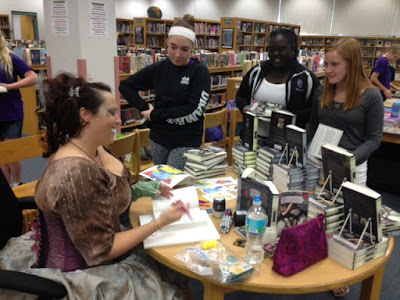 For bestselling author Alethea Kontis (a.k.a., Princess Alethea), visiting schools isn't just about selling her books. It's about promoting literacy and inspiring teenagers to persevere through what could very well be one of the most trying periods of their lives. Notoriously, middle school is an age in which students everywhere experience universal complexities which can seem unequivocally daunting and hopelessly difficult to go through—until they talk with others who have overcome similar challenges. Princess Alethea draws from her own personal experiences in relating to students. "Middle school is super, super tough for kids," she said. "I was really popular in the 5th grade. When I got into the 6th grade, my best friend 'broke up with me' and suddenly I had no friends. It was really, really hard." By encouraging students to keep believing in themselves and to stay true to their dreams, Princess Alethea helps make life easier and brighter for students. "Middle school is very pivotal but it was also the worst experience of my life. That's why I like visiting schools—particularly middle schools. I write the books that I would have liked to read when I was 12. I am the person now who I wanted to be when I was 12, so in a sense, it was a happy ending for me." For two days, Princess Alethea visited the Books-a-Million Book Fair at Space Coast Jr./Sr. High School and signed books for student. She made a lot of connections with students, who found her easy to talk to about books, writing, and the middle school experience. "I'm BFF's with everybody," she said. With her signature smile, Princess Alethea signed personalized copies of her books for students who were eager to read titles such as Enchanted, Dearest, and Hero. "Princess Alethea is very nice," said Adrianna Patracone, a 7th grader. "Her books sound very interesting. Some of the characters in her books are actually based off of some of her siblings, which seems funny." "It was cool meeting the author," said Sara Flanigan, an 11th grader. "I really want to read her books." When students have the rare opportunity to meet a successful author, it is common for them ask questions about how to become a published author down the road. What advice does the author have for young, aspiring writers? "Never stop writing," she said. "I wish I had written more when I was younger." 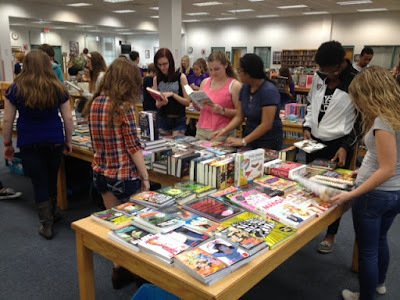 At the Books-a-Million Book Fair, students had a chance to view a wide selection of books covering a variety of subjects, genres, and topics. In addition to signing books and speaking to students about writing and the middle school life in the Media Center during the book fair, Princess Alethea also visited students in Mrs. Lorie Marshall's reading class to share her enthusiasm for reading. "My students asked a lot of good questions," said Mrs. Marshall, who is Space Coast Jr./Sr. High School's Teacher of the Year. "They were really curious about how she got her story ideas. She took the time to explain where a lot of her ideas come from and how she goes about writing her stories." The fiery enthusiasm Princess Alethea feels for her characters and stories is transparent in the way she exhibits elaborate costumes complete with a glowing dress, glittery face paint, and a magnetic smile as she brings her characters to life in front of students. 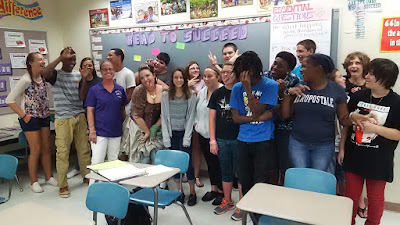 "I thought a lot about the author's visit and her approach with the students," said Mrs. Marshall. "I feel like if authors got into their characters as much as Princess Alethea does, then more kids would buy into the idea that reading is fun." Students in Mrs. Lorie Marshall's reading class enjoyed a surprise visit from bestselling author Alethia Kontis. "It was fun visiting Mrs. Marshall's class," said Princess Alethea. Princess Alethea's visit and the book fair was made possible by Mrs. Carol Manders, the Event Coordinator of Books-a-Million in the Brevard area. "It's a lot of fun doing book fairs," she said. "I have a love of reading and I like to share it with others. My favorite part is the interaction with the kids and being able to introduce them to new authors and titles." Books-a-Million offers an extensive selection of books which appeal to readers of all ages, reading levels, and interests. "After students pass the Scholastic Book Fair age, there isn't really anything out there to fill the need, especially at the high school level," said Mrs. Manders. "I believe in Books-a-Million being part of the community." "I love book fairs," said Bryce Davis, a 7th grader. "There are tons of chapter books offered." Proceeds from the book fair also allows the Media Center to add a wider selection of books to offer for student checkout. "There are such a bigger variety of books available at the junior senior high school level library," said Bryce. 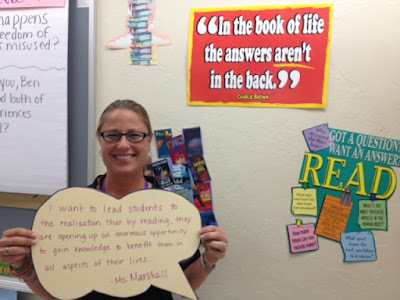 "I've read triple the amount of books at Space Coast Jr./Sr. than I read in elementary school." The life of a teenager isn't always easy, but when it comes to getting excited about reading and writing, a visit from a bestselling author coupled with a book fair certainly helps shine light on their world. To learn more about Alethea Kontis and her books, visit her website. Some people are born to draw. Others are born to teach. Mrs. Carolynn Gannon was born to do both. Teaching over a span of 25 years, Mrs. Gannon has inspired thousands of students to assemble a multi-dimensional view of drafting as a vehicle for expanding career opportunities and enhancing personal rewards upon graduation. "I came through industry," she said. "I was a drafter and designer for Kennedy Space Center. My former drafting teacher, Dell Likens, was very likable and influential. He convinced me I should become a teacher. The year he retired, I walked into my old classroom as a teacher. I even found an old gradebook with my name in it!" The career move has paid measurable dividends in the form of positive impact on the lives of students. "I fell in love with the kids," she said. "It was so neat to see all the potential they have to be successful." "I used to tell students, 'They paid me to draw. I made a living out of just drawing. It was a great thing because it was something I was able to do and enjoy so much.'" With her passion and expertise for drawing and teaching serving as a blueprint for the success of a fleet of workforce-ready students, the Manufacturer's Association of Central Florida (MACF) recently recognized Mrs. Gannon at their Annual President's Award Dinner as the 2015 Educator of the Year. Space Coast Jr./Sr. High School Principal Robert Spinner celebrates a crowning achievement for drafting teacher Carolynn Gannon, who was recognized by the Manufacturer's Association of Central Florida as the 2015 Educator of the Year. "I was completely surprised at the award," said Mrs. Gannon. The Executive Director of the MACF, Mrs. Sherry Reeves, works with education and manufacturing leaders through Seminole, Orange, Lake, Osceola, and Brevard counties. "My job is to be a connector," she said. Mrs. Reeves views teachers like Mrs. Gannon as the critical link between providing students with a 21st century education that is rigorous and relevant and providing industries like manufacturing workers with a solid foundation to flourish and grow. "At the end of the day, it is important that we educate parents, teachers, counselors, and students that there are some very high paying jobs out there." The Vice President and General Manager of Knight's Armament, Mr. Art Hoelke, nominated Mrs. Gannon for the Educator of the Year Award. Staunch advocates of Space Coast Jr./Sr. High School's STEAM Academy, Mr. Hoelke and Mr. Reed Knight (the owner of Knight's Armament) have volunteered a great deal of time, money, and resources supporting students, projects, and learning goals in Mrs. Gannon's classes. "Mr. Knight and Mr. Hoelke are both so passionate about education," said Mrs. Gannon. "They are so involved with the schools. 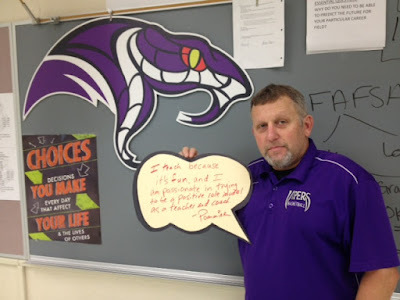 Mr. Hoelke encourages students to learn as much as they can from their teachers, and Mr. Knight tells the kids all the time, 'Find your passion and you can do anything.'" At the MACF dinner, it became apparent to Mrs. Gannon that manufacturers are counting on educators to help students develop the necessary skills required to excel in jobs. She said, "At the dinner, they asked industry leaders, 'How many of you in here are trying to hire skilled people for your company?' Every hand went up. There is a shortage of truly skilled workers to fill these positions." "Manufacturing is no longer considered grunt work," she continued. "It's high tech. Manufacturer's want students to be trained for the workforce. They're looking for people that have the proper skills. These are technical positions. The whole STEAM Academy, these students can jump out and became a designer, an engineer, a machinist, an assembler. It's not, 'Oh, you're going to be stuck drawing.' You'll be able to branch out anywhere." What can students expect when entering into Mrs. Gannon's drafting classes? "I take the kids from the most basic fundamentals of geometric construction," she said. "People call them blueprints; we call them orthographics. It shows how the pieces fit together and why these views are necessary." "I explain to students that everything in the world, unless it's an artistic creation, someone had to technically draw these creations. The pencil you're holding, someone had to make the machinery to manufacturer that pencil, and someone had to draw the technical plans on how to make the machinery. I'm showing them that everything they're doing in here is related to what they'll do out there in the workforce." As Mrs. Gannon explains, her students will have a major advantage when it comes to finding jobs. "Florida has a huge manufacturing industry with companies of all sizes—from mom and pop shops all the way up to massive companies—and countless career opportunities our students can pursue upon graduation. If they choose to go into manufacturing out of high school, they will be earning more money than many students coming out of college." Drafting students rave about the difference their inspirational teacher is making in their lives. Students in Mrs. Gannon's Advanced Drafting class appreciate the freedom they have to explore their strengths, learn from their mistakes, and achieve great heights of learning through the support and guidance of the 2015 Educator of the Year. "A lot of students are excited," said Mrs. Gannon. "Some of them have said to me, 'You deserve it!' It's really nice to hear." "Mrs. Gannon is an amazing teacher," said Briggs Kline, a 10th grader. "She has been one of my favorite teachers. She helped me get into the STEAM Academy. I love the program. It is helping me learn more about the foundation of engineering and architecture. I want to be an engineer or an architect in the future." Marissa Martin is the 10th Grade Class Representative. "I love Mrs. Gannon. She doesn't put up with any nonsense. She's able to joke around with students and still get her work done. She listens to what we have to say and helps fix issues right away when we need help." Co-Class Representative, Kailey Draa, agrees. "I think she's one of the best teachers here. She doesn't babysit us; she lets us do it our own way. She lets us learn through trial and error. When I get out of school, my boss isn't going to have to walk me through anything. I'm going to be able to do a lot of the work on my own." MACF's 2015 Educator of the Year is not only drafting a top quality education for her students, but she is helping them construct a foundation for higher paying, more satisfying careers. As industry standards go, Mrs. Gannon was born with the master blueprints to teach and draw. To learn more about the Manufacturer's Association of Central Florida, visit MACF. See the district-wide recognition Mrs. Gannon received in a recent BPS News in a Minute feature. For Space Coast Jr./Sr. High School teachers, a recent professional development meeting centered around a 3-letter word that is small on paper but enormously powerful as a fuel for performance: Why? The Assistant Principal in charge of curriculum, Mrs. Lena Koch, led a professional development session that encouraged teachers to consider the purposeful reasons behind their daily efforts to educate and inspire students. When it comes to teaching students—with all the challenges, complexities, and demands inherent in the profession—focusing on the why matters far more than the what and the how. During the meeting, teachers were posed with a simple yet thought-provoking exercise. They were asked to complete the sentence beginning with "I teach because..." and write their response on a printed thought bubble. Mr. Nicholas Stewart, a math teacher and basketball coach who shows up early and stays late to help his students and players succeed, addressed his colleagues at the meeting. He shared some very compelling reasons for why he works as hard as he does to balance the demands of teaching and coaching with those of family and personal life. "The whole reason for doing everything that I do, and for having the high level of dedication I have is for the kids. Whether it be coaching-related or the teaching aspect, I always try to do what is required to make life better for the kids." Because he cares so much about what is in the best interests of his students and players, math teacher and basketball coach, Mr. Nicholas Stewart, works many extra hours to enhance the lives of kids at Space Coast Jr./Sr. High School. 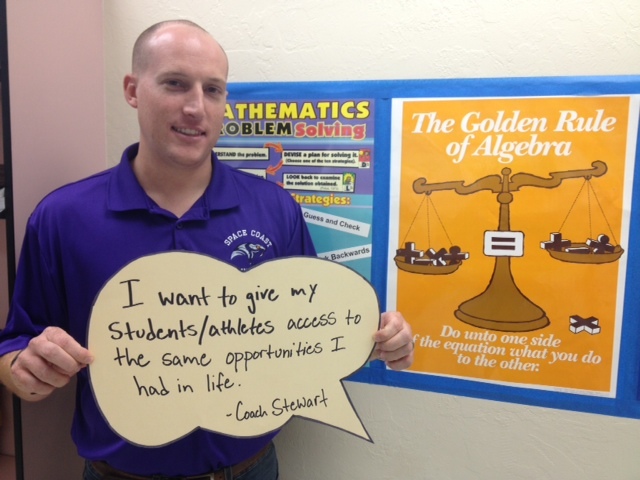 "I want to give my students/athletes access to the same opportunities I had in life." Coach Stewart is not alone in his passion to serve students. Driven by 'whys' close to their heart, the entire faculty is comprised of teachers focused on helping each student fulfill their potential. Middle school teacher, Ms. Lauren Daubs, has an insatiable enthusiasm for teaching language arts, math, and pre-algebra. "I teach because I want to have a positive impact on students and and their future. I want life to matter, give it meaning, make it great and fun, and worthwhile." As part of the meeting, teachers watched a TED Talk by author and motivational speaker Simon Sinek, who conceptualized how great leaders inspire action from the inside out, rather than the outside in. During his speech, Sinek challenged his audience to dig deep and explore the why behind their daily actions. "What's your purpose? What's your cause? What's your belief? Why do you get out of bed in the morning?" 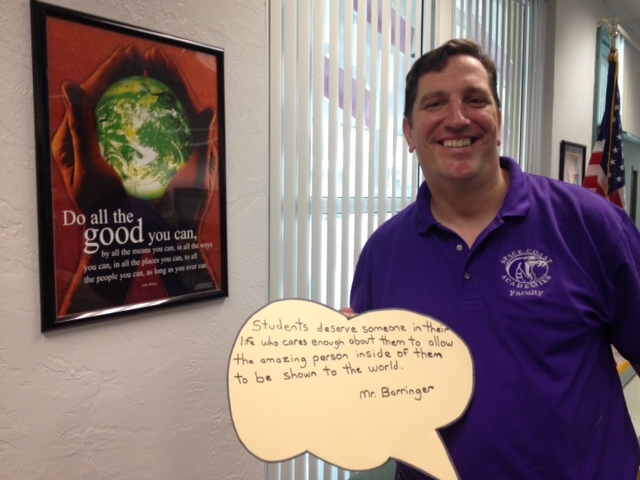 Mr. Matthew Barringer, a 9th grade World History teacher, is driven by a passion to help students. "Students deserve someone in their life who cares enough about them to allow the amazing person inside of them to be shown to the world." Renowned professor and education researcher John Hattie is credited with undertaking the largest and most ambitious study of factors that impact student achievement. His work culminated in the publishing of Visible Learning in 2009, and led to the release of Visible Learning for Teachers in 2012, in which Hattie articulated what he refers to as the Eight Mind Frames for Teachers. Teacher of the Year, Mrs. Lorie Marshall, inspires middle school students to read and succeed. "I want to lead students to the realization that by reading, they are opening up an enormous opportunity to gain knowledge to benefit them in all aspects of their lives." Hattie's 8 Mind Frames for Teaching, in many ways, revolve around 'the why' behind teaching. Among other suggestions, he encourages teachers to evaluate their effect on student learning, take responsibility for being a change agent in each child's education, develop positive relationships, and inform students about the language of learning. Mr. Michael Pommier teaches Career Research and Decision Making to 9th graders, and also coaches the boys basketball team. "I teach because it's fun, and I am passionate in trying to be a positive role model as a teacher and coach." Reflecting on the value of considering the why behind what and how teachers do what they do, Mrs. Koch felt the timing was right to help reconnect teachers with the purpose in which they entered into the profession. "Thinking about the concept of why you are teaching made me think that sometimes, we need to come back to why we're here. This is the time of year it feels like everything is piling up on us and it is a good time to reflect on why we're doing what we're doing." 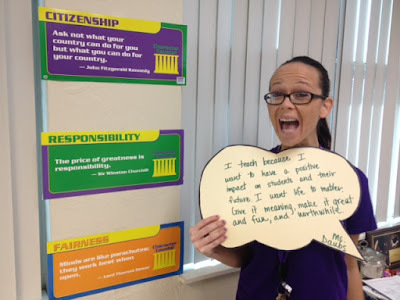 Assistant Principal Mrs. Lena Koch oversees curriculum and helps develop teachers at Space Coast Jr./Sr. High School. She often encourages teachers to remember why they are doing what they are required to do in order to maximize student learning. As Sinek stated, "It's those who start with the 'why' that have the ability to inspire those around them." For a such a small word, 'why' surely packs sizable power to change the world. It is most certainly the why that helps teachers at Space Coast teach and inspire students every day. See Simon Sinek's "How Great Leaders Inspire Action" TED Talk here.